Both ends of the route are remote and getting to the start line or from the finish line can be challenging. However, this page should help tremendously and ease the difficulty of taking on this adventure. La Push is located in the Northwest corner of Washington state and has the western-most zip code in the contiguous United States. It is easily accessible by car via ferry and a 4+ hour drive from Seattle. ​If you can't con a friend into driving you to the start, your next best option is a series of busses. Dungeness Line provides bus service from SeaTac Airport and the Amtrak train station in downtown Seattle to Port Angeles. Reservations are highly recommended. Be sure to tell them you have a bike so they can provide you options. ​Once you're in Port Angeles, the next step is to take the county bus to La Push. This is via Clallam Transit. 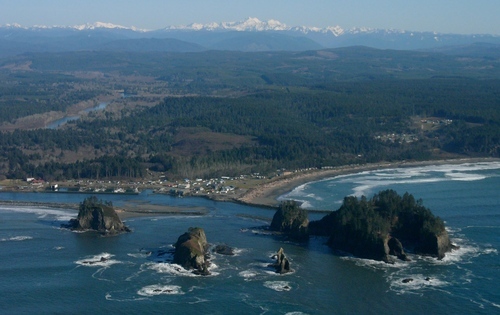 ​A motel and cabin rentals are available in La Push at Quileute Oceanside Resort. Camping is available at Quileute Oceanside Resort and Lonesome Creek Store & Resort in La Push as well as at 3-Rivers Resort which is six miles from the start. There are more lodging options in Forks just 15 miles away. ​​There is the River's Edge restaurant and Lonesome Creek store in La Push. Lonesome Creek Store and Resort has a small grocery store in La Push. A similar store is available at 3-Rivers Resort along with a basic menu consisting mostly of burgers. The 3-Rivers Resort is 6 miles from the start. More options are 15 miles away in Forks. Tekoa (Pronounced Teeko) has a rich heritage and history, having played a key role in the development and support of neighboring communities and farms for over 100 years. Tucked away in an incredibly scenic portion of Whitman county, Tekoa is situated at the base of Tekoa Mountain (elevation 2,490 feet), on the extreme eastern end of the rolling hills known as the Palouse, and to the west of the mighty Benewah Range of Idaho. With a population of over 800, Tekoa retains it's small town size and charm. Surrounded by mountains and farms of cattle, wheat, barley, bluegrass and lentils, it was once the busy hub of the area's railroads. ​Just 39 miles south of the Spokane Valley, 48 miles north of Pullman, and about 55 miles from the Spokane International Airport, it's only a short drive away from major metropolitan areas. ​Tekoa is a super bike-friendly town and a great place to hang out to cheer on others as they finish.  ​The Tekoa Trails and Trestle Association is a great resource to learn more and coordinate logistics at the end of the route. ​Shuttle service to Spokane is available from Tekoa. Call (509) 284-2080 for information. From Spokane you can take a train, bus, or flight back to Seattle. You can also rent a car. Permits are required for the eastern portion of the route. These permits are free and have no limits. A DNR permit is required for the segment from Warden to Lind. A Washington State Park Permit is required from Lind to the Idaho border. In exchange, The DNR and State Park officials will give you combinations that are locking some of the gates across the trail. This is much easier than lifting a fully-loaded bike over these formidable gates.